Pompey made is camp on Mt. Dogantzes about 3.5 miles from Caesar’s camp. Each day Pompey would line up his troops in front of his camp, tempting Caesar to attack on unfavorable ground. Caesar decided to shift his camp and always be on the march. This would make it easier for his men to gather provisions and it might draw Pompey into battle. When his troops were getting ready to break camp, Caesar noticed that Pompey’s men had come down the slope. Now that neither side had the favor of higher ground, Caesar ordered his men to line up for battle. Pompey had decided to finally give battle, His plan was to use his superior cavalry to attack Caesars exposed flank (the opposite side of where the men carried their shield - the right flank) Pompey commanded around 40,000 infantry and more than 3,000 cavalry (some say as much as 7,000) and 2,000 auxiliary light infantry. On his right wing Pompey positioned Leg. I and Leg. III under the command of Labienus. These were the legions that the senate had ordered Caesar to give up before the Civil War began. The center was made up of Pompeys legions from Syria. The Cilician legion was on Pompey’s left wing with cohorts from Spain commanded by Afranius. The remainder of his cohorts were spread in along the middle of the line. All his cavalry, archers and slingers were on his left wing because the Enipeus River protected his right wing. Pompey left 7 cohorts to guard his camp. Caesar commanded around 30,000 infantry, 1,000 Gallic and German cavalry, and 2,000 auxiliary infantry. He positioned Leg. X on the far right wing. Publius Sulla commanded this side. On the far left he put the IX combined with the VIII because they were both at half strength. Antonius (Mark Antony) was in command here. He had 80 cohorts formed up center of the line under command of Gnaeus Domitius. Seven cohorts were left to guard his camp. Caesar noticed the large build up of cavalry facing his right wing and guessed at their purpose. Afraid of being outflanked, he took 6 cohorts from the third line and placed them on the right to meet Pompey’s cavalry. As was custom, Caesar gave a pep-talk, and then signaled the battle with the trumpet. The men of the Legion X were the first to charge. Pompey’s men did not move. He had instructed them to allow their enemy to waste energy running. Of course, Caesar’s experienced men realized this and stopped their charge about half way. They calmly marched forward and then renewed the charge. As this happened, Pompey’s cavalry surged forward and broke through Caesar’s cavalry. 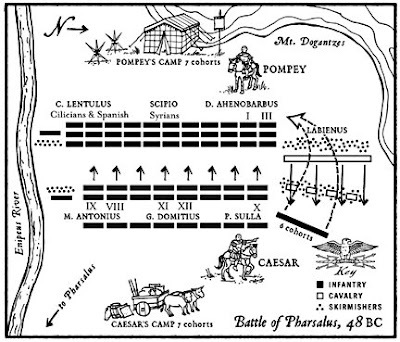 Pompey's men broke into smaller squadrons and were beginning to out flank Caesar’s lines. This was when the 6 cohorts were given the order to charge. None of Pompey’s cavalry withstood the attack. They did not just retreat, they bolted for the safety of the hills. Pompey's archers and slingers were left without protection and were wiped out. The 6 cohorts then continued their attack, sweeping in behind Pompey’s left flank and attacking the soldiers from behind. All the while Caesars battle hardened third line was standing still. Once Pompey was outflanked, the line charged in to replace the exhausted men already fighting. At this Pompey’s men fled to their camp. Caeser’s men continued fighting and began attacking the fortifications. 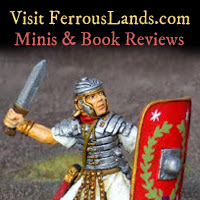 Pompeys Thracians and other auxiliaries were the ones fighting back the hardest, whereas the men who had just fled ran further in to the hills, many dropping their weapons and standards. Caeser urged his men not to waste time looting, but had them instead build fortifications surrounding the hill. Pompey’s forces lost hope and surrendered. About 15,000 of Pompey’s men had fallen. 24,000 had surrendered. 9 Legionary standards and 180 unit standards were captured. Lucius Domitius had fled into the hills, but he was tracked down and killed by Casers cavalry. Caser lost only about 1,200. Scipio escaped to make war in Spain. Labienus continued the fight in Africa. Though, they’re fight did not last long. Pompey had fled the battle and made his way to Egypt. However, King Ptolemy XII knew it was unwise to harbor such a fugitive. They had him killed and his head sent back to Caesar, upon receiving this horrible package, Caesar burst in to tears.